Mouth to Mouth - Gallery of Dolls 7"
Lead by vibest DJ Bonebrake (known for his drumming in the seminal punk band, X), Orchestra Superstring is an ensemble of Los Angeles-based veteran musicians who plays an exotic, hypnotic blend of Afro-Cuban, Latin Jazz and other world music. Their sound is purely instrumental, intimate, seductive, dimensional and brings to mind a dimly lit South American dance hall, or something you might hear in a Lynch film filtered through the sounds of a 1950’s film noir style Mambo session with an edge from a sort of spooky and distorted hollow-body guitar not unlike late ‘60s Robert Fripp. It’s all very tasty and atmospheric. 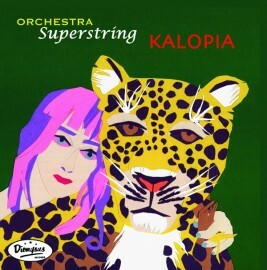 “Kalopia” is their first vinyl release and contains the best tracks from their two Dionysus CDs “Orchestra Superstring” and “Easy”. This album was cut on a vintage Scully lathe using a Westrex 3D stereo cutting head.